The Nuclear Option Brotherhood of Steel is a Quest in Fallout 4. It is one of 3 variations of The Nuclear Option main quest, along with The Nuclear Option The Minutemen and The Nuclear Option The Railroad. This quest is available by completing the essential Quests of the Brotherhood of Steel. NOTE: This quest is only available if you have chosen allegiance to the Brotherhood of Steel. Head through the robotics area, defeating Synth enemies along the way. Drop through the hatch to enter the BioScience lab, and continue towards the reactor entrance, which at this point has had its blast door activated. Press the button at the central elevator to enter Father's quarters. You will obtain the password to override from him, or you can hack the terminal. Do either, and activate the Master Security Lockdown Override. You may trigger an evac warning to spare lives; this is an optional choice. Go back through Advanced Systems to enter the reactor chamber. If you haven't evacuated the facility, you will encounter synths and scientists. Access the reactor door and then activate the housing. Agree to save him and look after him, at which point Ingram will look after him until you reunite at Boston Airport. Say the child must stay. Speak into the relay and teleport to the Mass Fusion Building roof where you can press a button to complete your mission. 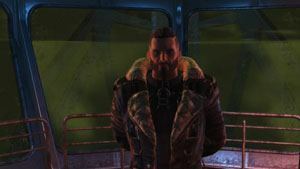 Speak with Elder Maxson to conclude your main quest journey. After starting this quest, >>>do not enter the institute in power armor<<<. it can turn NPCs hostile for no reason, skip over quest stages or bug the whole thing so you end up in the institute alone with no objectives and no way out.